The ancient parish was of great extent. It comprised the Caernarfonshire township of Gwydir; and the Denbighshire townships of Cilcennis, Tre'r Dre Isaf, Tre'r Dre Uchaf, Garthgyfannedd, Mathebrwd, Tybrith Isaf, Tybrith Uchaf, and Garth Garmon. In 1866, a portion of the township of Gwydir was transferred by an Order in Council to the parish of Capel Curig, in Caernarfonshire. Tybrith Ucha and Garth Garmon had for many years operated, unofficially, as the parish of Capel Garmon; and this was made official in 1927. The church was founded in the sixth century by St. Grwst, and has been on its present site since the thirteenth century. It was restored in 1884. 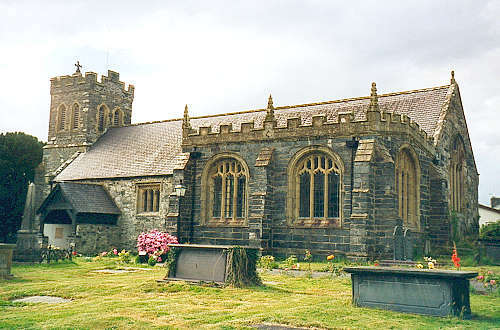 For family history information about the church and parish, visit the GENUKI Llanrwst page.